How is it that a guy who can run this fast shows up late? Evil nemesis to the Flash, capable of superhuman speed; aims to destroy all connected to the Speed Force. Mattel's choices are perpetually befuddling. Can you think of any other time a mixed line of figures (ie, one not themed around a single character) released two versions of the same person in the same series? DC Multiverse Series 3 already featured "Jay Garrick," and now it also features his villainous alter ego, as well. For comparison, consider if a single series of Marvel Legends had both Sam Wilson Captain America and Sam Wilson Falcon. It'd be weird, right? The comics' version of Zoom wore the same basic costume as Reverse Flash, just with creepy black eyes on his mask. The television version looks more like the Black Flash - his costume is the same kind of leather or canvas or vinyl or whatever it is Barry and Eobard's costumes are made of, but it's all black with silver piping. It continues to be completely surprising when Mattel creates new molds for their Flash-related characters, rather than just reusing the same one over and over; yes, this is accurate to the show, but Mattel is usually so lazy and halfassed with their superhero toys that doing something right seems out of character for them. The detail on the sculpt is subtle yet intricate, with a fine texture, low wrinkles, and overlapping panels of material that create a lightning bolt pattern. Zoom's head is creepy as hell! Unlike Flash and Reverse-Flash, his mask doesn't leave any skin exposed. The eyes are solid black (early appearances, before the design was finalized, gave them a blue glow) while the mouth is just a series of vertical slits across the lower half of the face, which is never not gross. This is a sinister character! 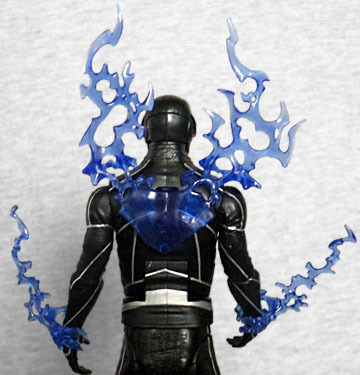 The articulation on this figure is as poorly engineered as it is on all Mattel's live-action DC toys, both movie and television. Zoom moves (somewhat) at the head, shoulders, elbows, wrists, chest, waist, hips, thighs, knees, and ankles. The upper body is larger than the lower body, like one or the other of them was molded the wrong size. It's not even a minor thing - you can easily see the size difference just glancing at the figure! The other two figures have similar things, but they were wearing belts, while Zoom's suit is supposed to be a one-piece. 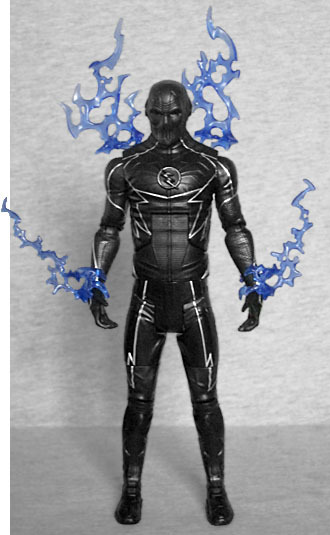 Unlike Barry and Eobard, Zoom gets some accessories. He was constantly crackling with oat bran electricity (blue, instead of the yellow/red the others displayed), so he gets the lightning bolts that originated all those years ago with Electric Superman! The back piece has been remolded, to remove Superman's S, but the shape of the shield is still there. In a way, it's rather fitting that Zoom would come with those energy effects: as we said, they originated with DCUC2's Superman; that Superman had a piece of the build-a-figure Gorilla Grodd; Grodd is one of the crazy characters Flash has not shied away from introducing; another crazy character they were brave enough to use was King Shark, and Zoom comes with that figure's head and hips. The TV version of Zoom may not look or act like his comic counterpart, but the design isn't bad. 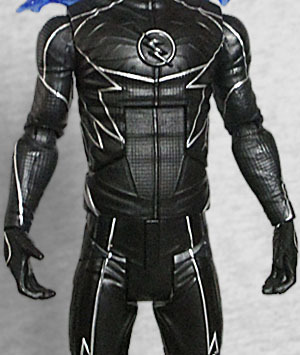 Heck, even if you don't plan to collect live-action figures, he'd make a good stand-in for the comics' Black Flash.